Automobile 2.0: The smart car is coming! I just have to say that I really, really, really want one of these cars! You can see them at the Smart Car website. They cost under $12,000 for the basic model, up to under $17,000 for the Smart fortwo Passion Cabrio which is a tricked-out convertible model. I like the middle of the road model, the smart fortwo passion, for under $14,000. I’ve seen this car overseas and admired it and now it is coming to the U.S. The vehicle is designed to achieve 40 plus mpg under normal driving conditions and current standards. The top speed is 90 mph, which is plenty for me. Here is a link to the FAQ page on the smart car. You can reserve a smart car for $99 which is applicable to your purchase of a smart car and is refundable any time. 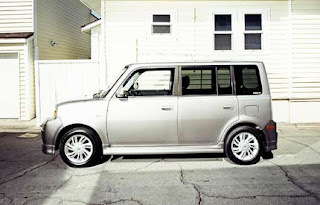 We bought a new Scion XB a couple years ago, which I also love (its name is Squeezle :). We are lucky we got one when we did because they discontinued the original XB and made a new one that is not nearly as cool. And we have a big Dodge Ram truck since we live in the country and get firewood and all. So we just don’t need another car and certainly can’t going buying everything we want. But I have some serious hots for this car! You are currently browsing the archives for the smart car category.